A win at Vendetta in Vegas but disappointing results at Worlds and a great number of other competition, where Vazgen was a participant but also a referee. Vazgen, how was your 2016? The year of 2016 was very busy and dynamic. Full of tournaments and championships, success and failure as well. Overall, it was a successful year to me, a progressive period of time. Tell about your biggest achievement, please? I got many achievements in 2016. Among them are my 2nd Gold at Arnold Classic, state of the art performance at Vendetta against Delidjakov, multiple tournament wins with prize money. Also, I traveled to Mexico to help Mexican Armwrestlers to organize their national championship. Lots of remarks on PPV and local TV Sports news, articles in newspapers and social media. Honored to be the Team USA Captain and acting president at the World Championships in Bulgaria. A trust that can be continued, I hope. The only failure was my performance at the World championship. I think I was able to show better results, it happened what happened. I know the reasons, I'm trying to fix them for better experience in next time. What could you call the real win and fail of passing year? I think it was very successful year for the sport of armwrestling in 2016. Great number of events in America and Worldwide, European and Asian Championships, World Championship, Zloty Tur, Vendetta Armfights with legendary armwrestlers. Also it important to mention all the TV exposure of our sports in America and at the World Championships. New countries joined World Armwrestling Federation as new members. The failure of 2016 could be disappeared A1 Russian Open, closing the perspective project of American Armfighter, financial difficulties of lots of armwrestlers worldwide with traveling to the World Championship, unsolved problems with doping control in many countries. Wish something for your friends, sport colleagues and armwrestling fans? I'd like to wish all my friends and colleagues happy holidays, wish them strong health and happiness in whatever they want to move on. Also all fans, thankful for your passion and love, keep following, because more great things are coming up. 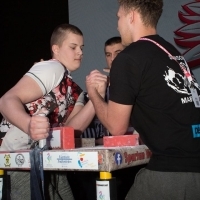 Armwrestling is a great sport and deserves a great future. We are sure that 2017 will be even more productive for Vazgen and we expect a real show from him. We'll keeping in touch with Vazgen for you. Stay tuned!